All about that base: (Are these too many pop references for you?) I’m wearing Chanel Vitalumiere Aqua in the Shade Beige Rose 20, with my Guerlain 4 Seasons Bronzer. I’d reckon’ to keep the cheeks minimal and avoid blush if you’re okay with a modern, edgy look. Otherwise, if you’re more of a traditionalist (make-up wise, obviously) use a blush with similar undertones of the red lip you choose. I Got My Eye On You: For the eyes, I kept it classic. Nars Hardwired Eye Shadow in Opal Coast all over my mobile lid, patted down with a flat brush. You will need to do this at least a couple of times to get the desired intensity. A quick heads up, some of you might want to use the shadow wet, but once you do that, the look becomes foiled and way too intense with a red lip, so do the patting with a dry brush. On the crease, I’ve used Sable and Espresso from my Lorac Pro to gently define the area. BE CAREFUL with Espresso from Lorac Pro, the pigmentation is quite strong, so always pick up on the brush, run it on the back of your hand to remove excess product and then sweep it on the crease. Lastly, curl lashes and apply heaps of an volumizing and lengthening mascara, I’m using my MaxFactor Total Transform Mascara. 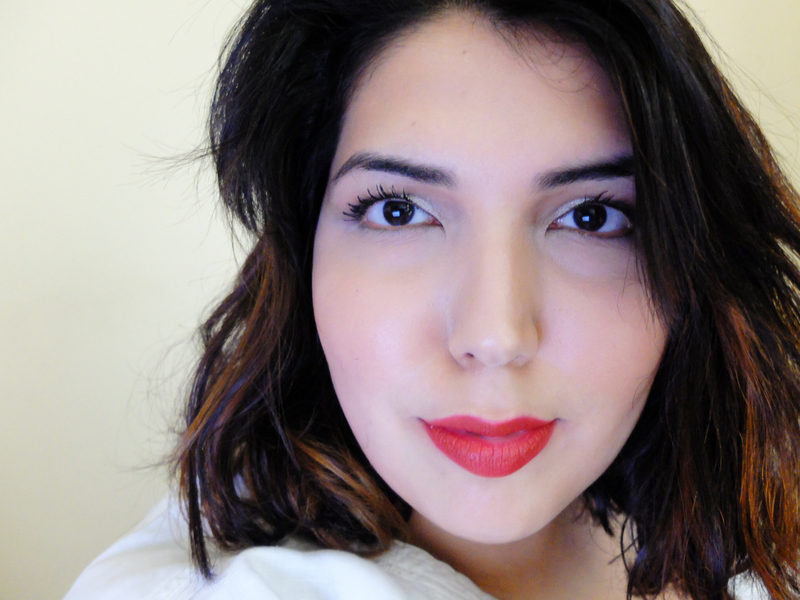 Cherry lips, crystal skies, I can show you incredible things: Ah well, now that every 1989 song is stuck in my head, I’m going to share with you an old fave of mine, Nars Velvet Matte Lipstick in Cruella. The shade is an absolute lipgasm! It’s a true red that looks stunning with cooler shadows on the eyes. Long lasting with an almost burger-proof application (True Story! ), I cannot get enough of how this gives a sallow complexion a quick pick-me-up. All I have done here is apply the lip pencil straight out of the bullet and it has done me well, what do you think?